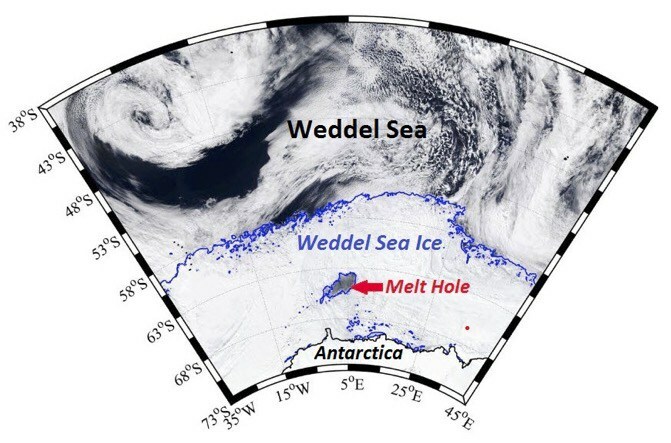 The sudden formation of a large and ‘mysterious’ melt hole in Antarctica’s Weddell sea ice (see Figure 1) is from heat flow generated by the underlying Maude Volcanic Plateau. “The gigantic, mysterious hole “is quite remarkable”, atmospheric physicist Kent Moore, a professor at the University of Toronto’s Mississauga campus, told me over the phone. “It looks like you just punched a hole in the ice.” (see here). “Areas of open water surrounded by sea ice, such as this one, are known as polynyas. They form in coastal regions of Antarctica, Moore told me. What’s strange here, though, is that this polynya is “deep in the ice pack,” he said, “and must have formed through other processes that aren’t understood”. (see here). Now we’ll explain how this event is related to relevant local and regional seafloor geological information. Let’s begin by comparing the local seafloor geological setting to the ocean surface geographic outline of the melt hole (Figure 2). Overlying sea-ice cover has been removed from the map below. This process reveals the ocean floor bedrock with its elevation highs and lows. Lighter blue color shading indicates ocean floor highs, conversely dark gray and black shading indicates ocean floor lows. Two ocean floor geological features dominate the map. First, a series of black shaded very low elevation gashes located in the upper portion of the Figure 2 map. These gashes represent major deep Earth reaching faults that are part of a world-class and very active rift/fault system. A fault system that is literally tearing apart the Weddell Sea floor. In fact, several very large 6.9 to 6.7 Richter Scale earthquakes have occurred along this fault system within the last seven days. Large seafloor moving earthquakes regularly occur along this rift/fault system. These active faults reach deep into Earth’s hot molten rock regions, thereby tapping into super-heated and chemically charged fluids. Splays of this fault system connect southwestward and intersect the Maude Volcanic Plateau which lies underneath the recent melt hole. It is here contended that these specific splay faults supplied and still supply hot molten lava and anomalous heat flow to the Maude Volcanic Platform. with the underlay of Maude Volcanic Plateau (black outline) and Mount Maude Seamount (red circle). Next, let’s discuss additional details of the Maude Volcanic Plateau (Figure 2). It was formed millions of years ago when several regional rift/fault systems became very active (see highly technical geological article). This volcanic plateau is illustrated on the map above as a black outline that is infill-shaded light blue indicating that it is a prominent, high seafloor elevation. The Maude Volcanic Plateau is also home to several large seafloor volcanoes (seamounts), most notably the Mount Maude Seamount as shown as a red circle on the above map. The most stunning piece of information that can be gleaned from the Figure 2 map is that the outline of the recent melt hole exactly matches the ocean floor outline Maude Volcanic Plateau. Absolutely astounding! This invokes the very strong possibility of a cause and effect relationship between Maude Volcanic Plateau heat flow and generation of the melt hole. The research defined outline of the warm pool was found to be slightly shifted to the southwest of the underlying Maude Volcanic Plateau. This is understandable given the paucity of temperature- measuring buoys and their shallow ocean depth restricted position. Keep in mind the Maude Volcanic Plateau resides at an approximate depth of 12,000 feet below sea level. It would be very reasonable to expect that the sea surface outline of the shallow “warm pool” would be slightly shifted from relative to its deep origin point. Importantly, the melt hole has a history of reoccurring at the same exact fixed/non-moving geographic location; 1977, 2016, and 2017. Sporadically occurring fixed non-moving anomalous ocean events are often associated with fixed non-moving geological features, such as ocean floor volcanic plateaus. Next let’s discuss the relevant regional geological aspects of the recent melt hole, again with an image that has the sea ice removed, thereby exposing the ocean floor bedrock geological features. (Figure 3). Figure 3: Regional Geology of Antarctic Continent and the Weddell Sea area. Sea ice was stripped off to expose underlying volcanic plateau’s, volcanoes and a major deep inner-Earth reaching rift/fault system. This very broad view illustrates the two most important ocean floor geological features in the regional Maude Volcanic Plateau area. First, on the upper portion of the map is the eastern extent of the same major deep Earth reaching world class and very active rift/fault system mentioned in the local geological review. This portion of the rift/fault system is also very earthquake active and the faults are also deep inner Earth reaching. The second important geological feature is the massive Kerguelen Volcanic Plateau which has one actively erupting volcano, Big Ben (see here, and here), located along its northern extent (red circle). The volcano just to the south of Big Ben (the other red circle) is active but not currently erupting. Kerguelen is known to be a very active heat flowing volcanic plateau. Research by the Australian Antarctic Division has proven that hundreds of currently active hydrothermal vents rim the now-erupting Big Ben volcano. Additionally, their research proved that ocean floor geothermal heat and heated fluid flow has chemically charged (iron) and significantly warmed all Kerguelen Volcanic Plateau surrounding oceans. This warming has acted to alter Kerguelen Volcanic Plateau area plankton blooms and disrupted multiple marine animal migration patterns. Lie south of, and are connected to, the same major rift/fault system. Actively emit ocean floor heat flow. Are associated with overlying warmed ocean areas. It is here contended that the known volcanic heat flow of the massive Kerguelen Volcanic Plateau is evidence that the entire Weddell Sea region is likely over active seafloor vents in varying amounts. Areas adjacent to faults and volcanic have more active, other flat ocean floor areas less active. In summary, by including relevant local and regional ocean floor geological information into the Antarctic melt hole analysis, it becomes obvious that bedrock heat flow and chemically charged heated fluid flow is the likely root cause of this event. http://onlinelibrary.wiley.com/doi/10.1029/2008GL034629/full#footer-citing Geology of Antarctica’s Maude Seamount (seafloor volcano).